Bompas and Parr is selling milk jam, which the label touts as being infused with a speck of Princess Diana's hair. Sam Bompas wants breakfast to be fun, a chance to start the day with food to fuel the body and stimulate the mind - and get some intriguing conversations started. What better way to do that than with a spread of Milk Jam infused with a speck of Princess Diana's hair. Yes, you read that right, Princess Di's hair. 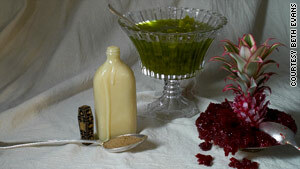 If you're thinking that doesn't whet your appetite, he has a few alternatives: How about a jam of absinthe and pineapple with sand from the Great Pyramids or plum and oak jam with wood from the British warship The Victory, Lord Nelson's flagship at the Battle of Trafalgar. Bompas isn't kidding about trying to sell you on jam with Lady Di's hair. But he is trying to get your attention - and is it ever working. Word of the jam that may include the golden locks of the beloved has spread globally online - with instant reactions ranging from stomach-inducing nausea, outrage of a publicity stunt or just straight confusion. Long term, Bompas hopes the public will be appreciating his creations as works of art. Which, ironically, is how all this got started. Sand from the Great Pyramids and wood from a British warship are among the ingredients in the occult jams. exhibits by Salvador Dali and Rene Margritte - he too wanted to jump outside the box. 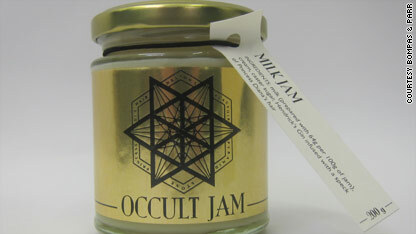 Enter the "occult jams" - known for jams infused with different objects in a search for eternal life. "We thought the most mundane food - but also magical - is jam," Bompas told CNN. "We thought there could be a way to come up with a real jam product that makes people excited about it and examine really quite how marvelous it is." Bompas decided he wanted to push it to the limit - to see how far he could go with infusing some of the strangest objects, but also ones we can all relate to - by putting them in his jam. So he got on eBay and purchased locks of Diana's hair and got together his other ingredients to start preparations. have those conversations about how they feel about it - it's the eternal debate of what is art. What has started out as art itself has become a product with a lot of major retailers." Perhaps Bompas has Princess Diana to thank for that, because now the founder is preparing to make the jam available through retailers worldwide, instead of just the store at the Art Gallery (where it sells for about $7 a jar). Bompas said the jams have been through all the normal testing procedures to ensure safety and shelf-life testing. In his world, Bompas hopes people would learn to be open-minded about what they are eating, or at least just start a conversation about it. It's something he says he regularly tries to do by recreating historical events - like flooding a building with four tons of cognac to recreate an event from the 1600s. For Bompas, the idea of boating through your alcohol was a fascinating experience. One he couldn't help but try to recreate. "I try to think - why hasn't that happened in my lifetime and then try and work to make it happen," he said. And that's the case with the jam. "What we'd like is to literally have people think about the foods that they put in their mouths," he said. "A lot of the things we do are history-oriented and hopefully end up quite magical and special." We are all made out of what got belched out of a dying star billions of years ago anyways. All I can say is...EWWWW! Totally disgusting. Do people actually buy this stuff? Normally people send food back if there's hair or dirt in it. Princess Di has been dead a long time. Where did they get her hair? You will rot in the darkest place with this repulsive and lewd product. Pete I would tell you to go to hell, but you are already there. Sick is CNN for reporting it. Just another tabloid move by a dying newsbroadcaster. Grow up and show just a tad-bit of class. Diana was a diamond that never needed a polish, she was grace without effort. Yet, your occult jam is exactly what should be done with that product and that is to jam it right up your keister! No Cleveland Steamers – When did God die and leave you judge? If the maker of this product (and Pete) rots in the darkest place, you will too. As you have judged so shall ye be judged. It's in the Bible, Dude! And notice the word 'infused'. It's not like they've gotten some jam and shoved some hair/sand/wood/whatever on top of it. Basically, you're all overreacting. majorly! B&P are masters at food as art.